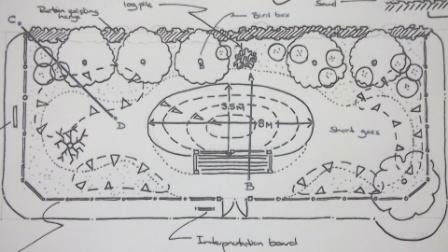 The Friends of Ridgefield have been successful in gaining a ‘Sustainable City’ grant from Cambridge City Council to create and develop a Conservation Area (more commonly known as ‘The Pond’) in the school. The first stage is to erect a fence around the whole of the grass area at the front of the building; this will be a wooden fence with mire mesh attached to the inside. There will be a gate in the centre of the fence which will be wide enough for disabled access; this fence will be 1 metre in height. There will also be signs placed around the site. In this stage, the hole for the pond will be dug. This will be 5 metres by 3 metres and a maximum of 1 metre deep. We will have the use of a mini-digger, which, with luck will be donated to us for a day. Once the hole has been dug and levelled, the liner and sand will be put in place; to complete this, we will need at least four people to help. Once the liner has been installed, the walkway can be laid. This will be a pathway consisting of concrete slabs laid around three-quarters of the pond. There will also be an inspection platform constructed from non-slip decking board. This will have an overhang of approximately 60cm so that the children can actively participate in conservation activities. The other quarter of the pond will incorporate a raised area of soil, which will be used to grow vegetation that will attract wildlife. At this point, the children will be able to become more involved by helping to plant shrubs and other wild vegetation. In this stage, wildlife is to be introduced into the pond and the surrounding area. In April 2014, the children enjoyed a day of supervised pond dipping and discovered over 20 species of mini-beasts. Click here to learn more about how successfully life has been introduced into the pond.